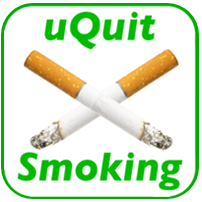 The uQuitSmoking Program Designed for use on the iPhone! The Most Comprehensive Quit Smoking Program Ever! The Greatest Tool Ever Created to Help uQuitSmoking! QUIT SMOKING SO YOU CAN SPEND MORE TIME WITH YOUR LOVED ONES!!! Instead of pulling a pack of cigarettes out of your pocket or purse, whip out your iPhone and use this specially designed program exclusively designed for your iPhone to help…uQuitSmoking!!! Includes all the tools and resources to quit smoking and stay quit. A Scientifically Proven Diet to minimize weight gain, stress, and anxiety when uQuitSmoking. Special Techniques to Remove Triggers that make you want to smoke, including the smell of someone smoking a cigarette. Includes a specially designed version of The Emotional Freedom Technique, combining Acupressure and specifically designed statements to help uQuitSmoking…No Silly Hypnosis here! Provides information on Nicotine Replacement Therapy, including nicotine patches, gum and lozenges. Prescription Smoking Cessation Aides that your Doctor can prescribe to help uQuitSmoking. Relaxation Techniques to help you relax and get your mind off of wanting a cigarette. Create a playlist to listen to music or an audiobook. Designed by a Peer Recovery Specialist who quit smoking 9 years ago and hasn’t had another cigarette since then. If you really want to quit smoking this is the tool that will Help uQuitSmoking.